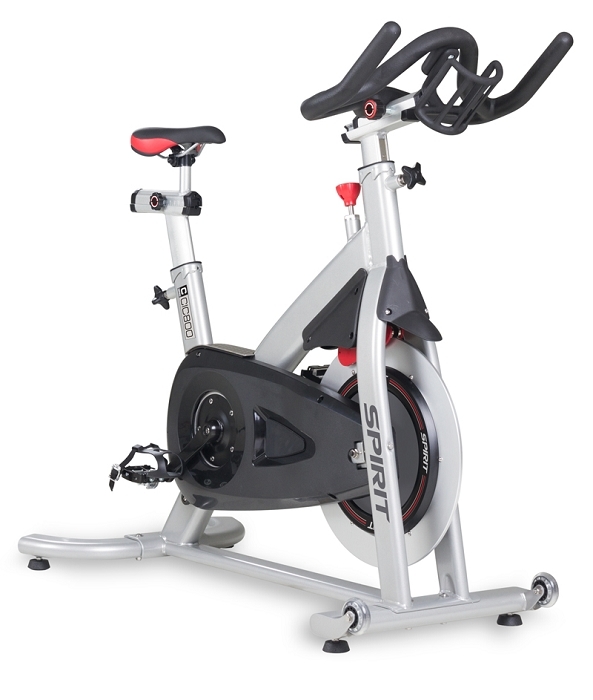 Spirit Fitness CIC800 Spin Bike - from Fitness Market in Louisville, KY. The premium bottom bracket cartridge ensures greater surface area contact, a sturdier connection, and less maintenance than a traditional square joint. This same bottom bracket cartridge is used on high end bicycles. There are many key components responsible for optimum performance of an indoor cycle. The Hutchinson drive belt, ISIS bottom bracket cartridge, pulley size and material, gear ratio and three piece crank have been carefully chosen on the CIC800 and incorporated into the overall design to assure optimal performance and durability. These components, along with an ergonomically correct frame design and full fore/aft/up/down adjustability, combine to make the perfect indoor cycle for your facility. 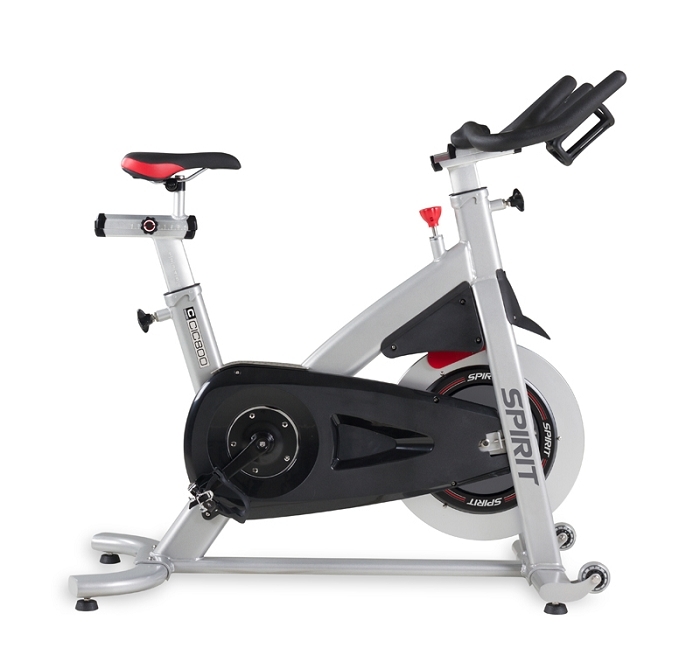 Spirit's amazing 10 YEAR PARTS WARRANTY applies when this cycle is purchased for use in the home (3 years parts when used in a health club). As with any product, customization is of extreme importance. We addressed this issue with a dual function pedal. On one side is a standard flat surface with a toe cage that appeals to the average exerciser. On the other side is a premium SPD clip that will be utilized by avid cyclists. The splined receiver for the pedal cranks enhances stability and requires less maintenance than a square receiver. Needle bearings that encompass the flywheel and pedal/crank joint promote quiet, fluid rotation. Rear joint cover offers a convenient, effective calf stretch. Oversized floor casters provide a stable base of support for simulated climbs out of the saddle and heavier riders. Aluminum seat and handlebar post with stamped height settings for quick reference. Up/Down - Reliable Pop-Pin Adjustments; Fore/Aft - Knob Tightening Micro Adjustments. January 13, 2015 - Jonesboro, AR — Spirit Fitness was again recognized by a leading consumer review magazine for offering a strong combination of value and performance in their treadmill products. In their February 2015 magazine issue their lab tested 33 treadmills. The Spirit Fitness XT485 Treadmill was recognized as “Recommended” for high marks in ergonomics, construction, ease of use, exercise range, and user safety. January 9, 2015 - Jonesboro, AR — Jonesboro, AR – Spirit Fitness was excited to officially announce the release of their new XE895 Adjustable Stride Elliptical Trainer. The features of the XE895 include 18”-24” electronic stride adjustment, padded oversized foot pedals, multi-position handgrips with remote resistance and stride toggles, large 7.5” blue backlit LCD, 20 levels of resistance, cooling fan, and audio jack with speakers for MP3 player. December 15, 2014 - Jonesboro, AR — The long history of Spirit Fitness producing quality fitness equipment was again recognized by Good Housekeeping magazine. In their January 2015 issue, their Home Electronics & Engineering Lab tested 14 leading brand treadmills. There were only 5 standouts and the Spirit Fitness XT385 Treadmill was recognized for durability and stability winning the “FOR THE LONG HAUL” award. December 8, 2014 - Jonesboro, AR — The 2015 FIT PROF Head of the Class reviews are complete and Spirit Fitness was again recognized for three BEST BUY awards in two different product categories. January 2, 2013 - Jonesboro, AR — Ringing in the New Year came word to Spirit Fitness that their best-selling XT285 and XT385treadmills won a “Best Buy” award from a leading consumer review magazine. The Jonesboro, AR fitness company has been manufacturing fitness equipment for 30 years and was excited by the news.